The stir started after Samajwadi Party chief Akhilesh Yadav was stopped at the Lucknow airport by the state police while he was on his way to Prayagraj. 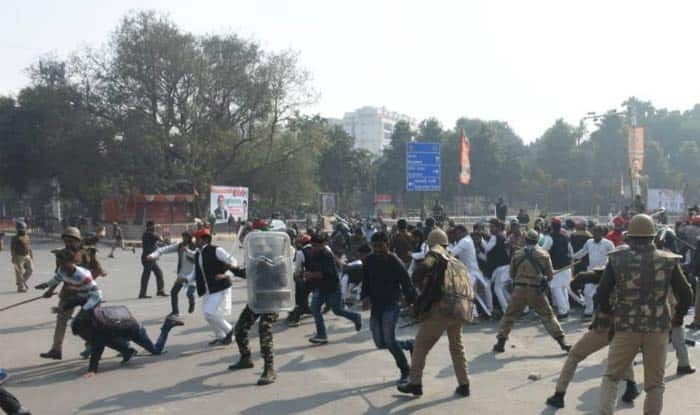 New Delhi: Police on Wednesday registered a case against 296 people in connection with the protest by Samajwadi Party (SP) workers. In this regard, a case has also been registered against 2 MPs including 46 people. The development comes a day after protests were held in Prayagraj against the denial of permission for party chief Akhilesh Yadav to travel to the city. Meanwhile, a 15-member joint delegation of SP-BSP submits a memorandum to Governor Ram Naik over the matter of Samajwadi Party chief Akhilesh Yadav stopped at Lucknow Airport on Tuesday. Hundreds of party workers wearing red party caps took to the streets and raised anti-Modi and anti-Yogi slogans on Tuesday. The protesters were led by Budayun MP Dharmendra Yadav, Phulpur MP Nagendra Patel, and Gorakhpur MP Praveen Nishad. The stir started after Samajwadi Party chief Akhilesh Yadav was stopped at the Lucknow airport by the state police while he was on his way to Prayagraj. This led to protests by SP workers right outside the airport. Yadav was scheduled to attend a student union function at the Allahabad University. I was prevented from boarding the aeroplane without any written orders. Currently detained at Lucknow airport. It is clear how frightened the govt is by the oath ceremony of a student leader. The BJP knows that the youth of our great country will not tolerate this injustice anymore! Later, it had emerged that the university had written to the SP chief, explaining why he could not attend the event. The University Registrar wrote that politicians were not allowed in its varsity programmes. Allahabad University Registrar had yesterday written to Personal Secretary of Samajwadi Party Chief Akhilesh Yadav, informing him that politicians are not allowed in university programmes.